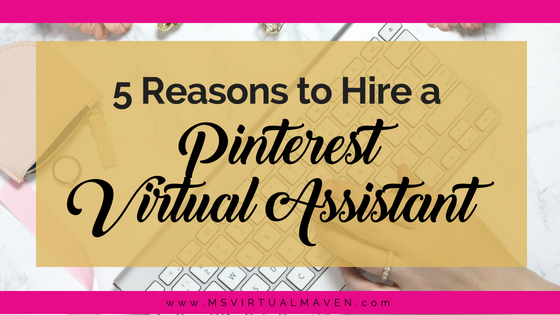 Are you spending all your time worrying about social media and the newest algorithm changes instead of hiring a Pinterest virtual assistant? You know you need to be on Pinterest to grow your page views and enlarge your audience, but how can you keep up with the never-ending changes? It’s no secret that Pinterest is a must for any online business these days. According to their website, 93% of pinners use Pinterest to plan their purchases and 67% of pinners say they discovered a new brand or product from content on Pinterest. You must be in the Pinterest game if you want to compete in the world of online business these days. However, keeping up with the trends, following Pinterest’s algorithm changes is daunting. Taking the time to organically reach your future traffic on the platform takes time away from your other more important priorities in your business. But, you see how successful other entrepreneurs are with Pinterest! Increasing your Pinterest reach will grow your web traffic. Increased website traffic brings in new customers and subscribers to your email list. While you know you need to be creating and selling your next signature course, product, service or even blog post to grow your business, you find yourself spending way too much time worrying about being all over social media to increase traffic to your website. Maybe it’s time you delegate your Pinterest marketing strategy so you can focus on your business instead. There are not enough hours in your day. Are you feeling like your to-do list is a mile long, and there is no way you can get to everything? Having a business, running a blog, providing services and having family demands can have you feeling stretched too thin. Then it might be time to delegate! 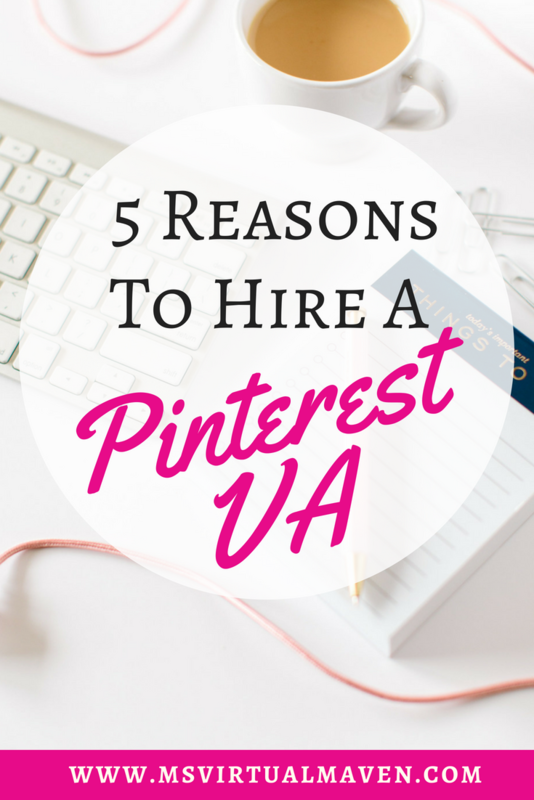 Hiring a Pinterest VA could free up your time to focus on your other priorities instead. Your Time ROI is not keeping up with your business. Are you spending dollar time on penny jobs? If you are making a decent income from your online business, then investing in a professional to manage your Pinterest marketing can pay for itself many times over. You have more important jobs to do and the ROI on social media is not worth taking your valuable time away from other priorities in your business. Investing in your business helps your business grow! Keep the overwhelm at bay. Is keeping up with the changing algorithms, pins sizes and what to pin stressing you out? Instead, focus on your own zone of genius to grow your business so when the traffic comes you are prepared to monetize. Staying ahead of all of the changes can be daunting and time-consuming. 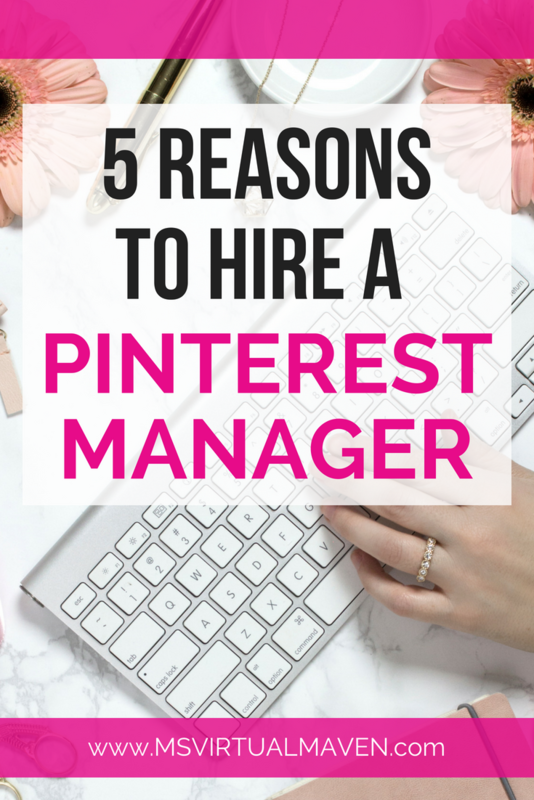 A dedicated Pinterest manager will keep up with the many changes so you don’t have to. Finding SEO keywords can be exhausting at best and completely overwhelming otherwise. Are you researching which keywords your audience is using to find content? Even though Pinterest is lumped in with all the other social media platforms, Pinterest is a visual search engine. This means that it thrives on keywords and pictures. Researching the perfect keywords for your pins is vital to your business, blog or product. There are specific places keywords should be placed on your profile. For example, are you putting keywords in your alt descriptions for each and every pin and photo on your website? This process ensures that valuable information follows your pin on its journey on Pinterest. Additionally, are the descriptions for your boards on Pinterest properly worded so that Pinterest knows the subject matter of each pin on there? This process requires time, energy and expertise. The question is – Do you want to spend time drilling down the details of Pinterest or grow your business in other profitable ways? Your graphic design skills aren’t the best. 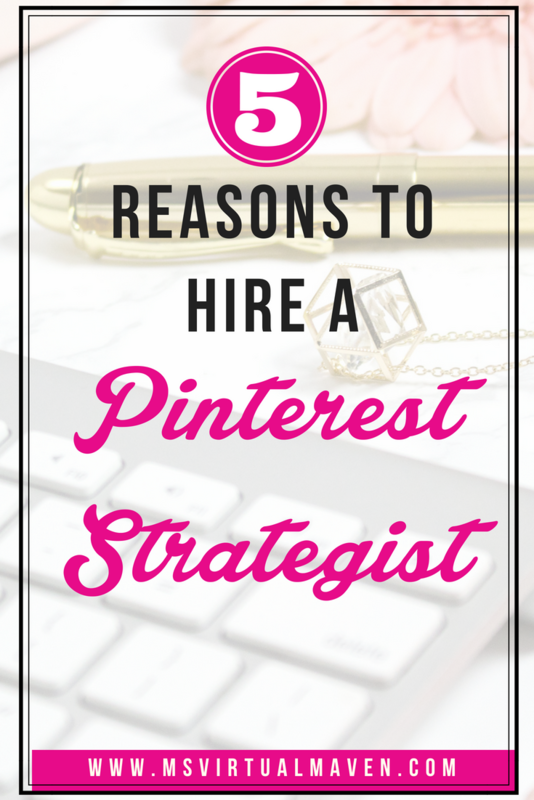 Are your pins not standing out in the vast sea of millions of other pins on Pinterest? Pinners see thousands of pins each day. A vibrant photo and catchy headline can be the difference in your pin being saved and clicked on versus being passed by. Again, these are tasks that are important to your business yet not imperative that they are done by you. If graphic design is not your forte, don’t sweat it. Outsource these tasks to free up your valuable time to working on your business instead of in your business. A dedicated Pinterest professional will take the time to follow the recent trends, learn the latest algorithms of the platform, as well as have a keen eye for design. Don’t let the stress of these activities overwhelm you and take away from more important revenue-producing tasks. Perhaps finding the right assistant for you and your business will free up your own time and energy to focus on activities that are actually bringing in your income. Pinterest is more than a social media website; it is a visual search engine driving curious future customers towards your website. Having a professional running your Pinterest marketing campaign ensures you and your business get noticed by the right people. According to Pinterest, 70% of people on Pinterest do more than simply browse; they search, save and click looking for specific products to fit their needs. Getting in front of the customer at the beginning of their purchasing journey is key to your business finding new customers and vital to new growth. Don’t leave your Pinterest marketing strategy to chance, invest in a professional Pinterest manager and watch your traffic and subscribers grow. 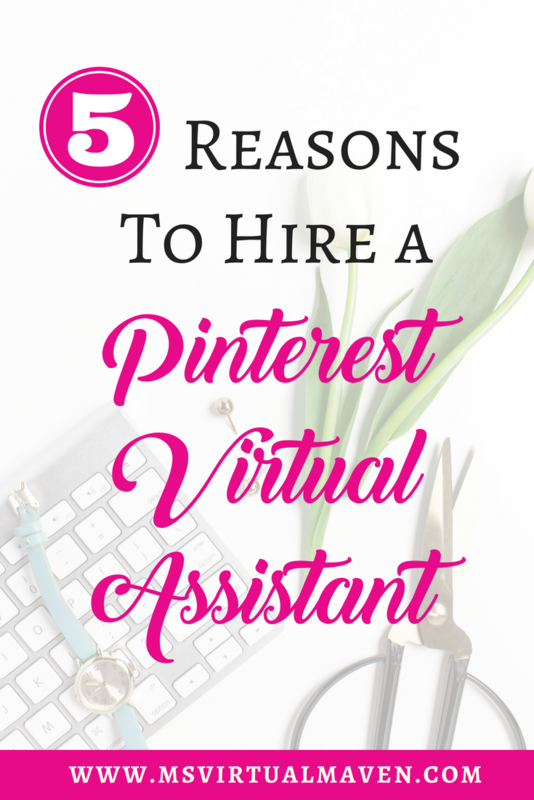 For more information on hiring a Pinterest virtual assistant, click here to schedule a free discovery call with me. We will talk about your goals for your business as well as your marketing strategy. Together, we can take your Pinterest presence from drab to fab and increase your reach, allowing future customers to find you and your business. We have everything from account audits to monthly maintenance plans and I would love to work with you to improve your Pinterest presence. Is Pinterest The Right Platform For Your Business?